My husband and I bought a home in November that had an in-ground pool that was part of the appeal when we were buying the house. Fast forward to the following spring when it was time to open the pool and have a fun summer together in it; we paid to have water put in it and then paid a pool company up the street from us to open it/add chemicals for us. To our dismay, we found out that the pool was leaking, and on top of that, probably needed a full renovation! 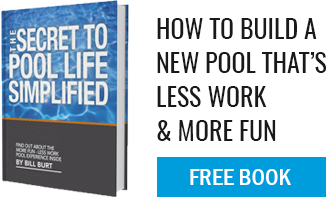 We were very let down and in panic mode because we knew the process of renovating a pool would be costly and a hassle. The company who originally opened the pool for us, and told us about the leak, told us they would have their diver get in contact to set up a time to come find out where the leak was coming from. Well we waited and waited, and never heard from him so we ended up calling him ourselves, to which we were told ‘we don’t go around looking for leaks.’ Okay, so that company was officially out of the running for our pool renovation. The last thing we wanted was a company with rude customer service who acted more like you were a hassle than a customer. We shopped around. We got quotes from four different pool companies. They were all within $5,000 of each other and three out of the four had good reviews online. What made us choose Aqua Pool & Patio in the beginning was that we found out that they were actually the ones who originally installed the pool at our home in 1984! We thought, ‘Who better to renovate the pool than the people who built it?’ Let me tell you, I am SO glad we made that decision. Let’s start with the people. Every person I talked to or had contact with, from the workers to the service manager, was dependable, courteous and hardworking. Personally, I had SEVERAL emails back and forth with Chuck. I had so many questions about the process, the money, the reasoning behind things and every time I emailed him with a new question he emailed me back right away with an answer and never made me feel like I was bothering him. He actually always encouraged me to ‘keep the questions coming!’ The crew who did the physical work on our pool was so hardworking and polite. They were there from about 8:00 AM to 8:00 PM each day and never left a mess and the work always looked amazing. Chuck even set up the electrician to come and take care of the filter timer and other things, and although he didn’t work directly for Aqua Pool, he was also very courteous and did a great job. Once the pool was complete, we had a ‘pool school’ with Dave to teach us about taking care of the pool and how to deal with the chemicals and cleaning. He was super nice and took care of all of our questions. In the beginning, my husband and I were petrified of this project, but now that it’s about 99% complete, we are in awe of how smoothly things went. Yes, it was costly, and we knew it would be; but now we have a brand spanking new pool that looks gorgeous and we didn’t have to go out of our way or daily lives to get it done. The project in total probably took about 2-3 weeks. Each time Chuck would email me with an update on what was going to happen next, I was in shock as to how quickly it was all happening. We thought for sure we would only have a week or so before the end of summer that we could use our pool. But because of the project’s quick timeline, we will get at least a month, maybe a bit more out of it this year. Aqua Pool even coordinates with several water delivery companies in the area and takes care of getting the water delivered for you, which was a big time saver for us. We were also lucky because the original, standard coping that we were going to have installed was several months out on manufacturing. Because of this, and so that we wouldn’t have to wait months, Chuck gave us an upgraded coping at no charge! Everyone comments on how nice the coping and tiling all goes together now. It really is very pretty and elegant. We would absolutely recommend Aqua Pool & Patio for your pool needs. We will continue to use them for any issues we may have, as well as yearly maintenance and opening and closing of our pool.